Set wire rack in rimmed baking sheet and line half of rack with triple alayer of paper towels. Whisk buttermilk and hot sauce together in shallow dish. Process 1 cup conrmeal in spice grinder to fine powder, 30 to 45 seconds. Whisk salt, pepper, granulated garlic, cayenne, remaining 2 cup cornmeal, and ground cornmeal together insecond shallow dish. Pat fish dry with paper towels. Working with 1 piece of fish at time, dip fish in buttermilk mixture, letting excess drip back into dish. Dredge fish in cornmeal mixture, shaking off exess, and transfer to large plate. Add oil to large dutch oven until it measures about 1 ½ inches deep and heat over medium high heat to 350 degrees. Working with 4 pieces of fish at a time, add fish to hot oil. Adjust burner, if necessary, to maintain oil temperature between 325 and 350 degrees. 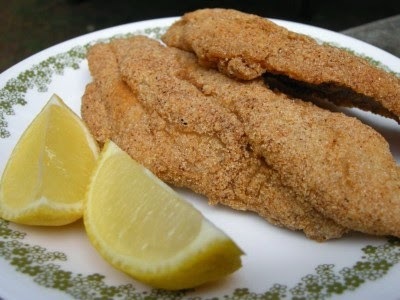 Fry fish until golden brown and crispy,a bout 5 minutes. Transfer fish to paper towel lined side of prepared rack and let drain for 1 minute, then move to unlined side of rack. Return oil to 350 degrees and repeat with remaining fish.serve with lemon wedges.